The story in two sentences: In this true story three Bodybuilder want a piece of the American Dream and kidnap a wealthy accountant to take over his life. Unfortunately the taste of wealth makes them greedy, and they want more which puts themselves into deep in trouble. 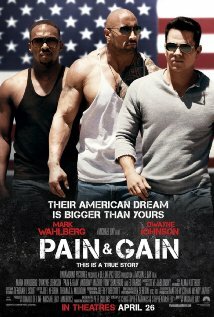 Storyline: Daniel Lugo (Mark Wahlberg) is a bodybuilding instructor who wants more. His wealthy clients disgust him becuase he wants their lives. Through a self-help seminar he gets the courage to take whatever he wants. So he forms a gang with Adrian Doorbal (Anthony Mackie) and Paul Doyle (Dwayne Johnson) to kidnap one of his clients (Tony Shalhoub) and force him to sign most of his belongings over to them. At first it looks good for them, but nothing is as good as it seems. My Review: Pain & Gain is a fast- paced and very entertaining movie full of drama and action. It is hard not to relate to the characters because they seem so human at some point but on the other hand ruthless and violent. Everyone has an evil side slumbering inside, but the question is will we let this side take over or do we chose to be decent and good? And on top of that how far are we willing to go to get what we want? Mark Wahlberg, Dwayne Johnson and Anthony Mackie are portraying their characters in a very entertaining and believable way, showing how people can change from evil to good, and from sane to insane. Rebel Wilson gives the final touch with her hilarious character, the black-fanatic nurse. From a movie aspect Michael Bay created a fun action movie for the summer that makes you stick around until the very end without getting bored or tired. But given the fact that it is a true story and people actually died and got tortured makes it a little less fun to watch, and it makes you wonder why Michael Bay chose the approach of making the story a “Dark Comedy”. Is he making fun of the incident? There is a huge irony when you hear the story because it just seems so unbelievable and I believe that’s what he was trying to show. I don’t think he wants to poke fun at anyone besides maybe the three “Bad Guys”. However, I understand that this movie might have gotten some bad reviews for this particular reason. Pain & Gain is an action comedy with a tragic and unbelievable but true story, that was critiqued for portraying the main characters too likeable, none the less I have to say it is definitely worth a watch.